Few things test a man’s sartorial savvy like sale shopping. When faced with a barrage of options, even the most level-headed guys can come away with an armful of ridiculously impractical and unwearable things. Fortunately, we’ve teamed up with premium high-street retailer Reiss for the launch of its up to 50 per cent off sale. So that you don’t spend your time scrolling indecisively, here are 15 items which you can wear now and well into next year. After all: fail to plan, plan to fail. Once a man has found the perfect leather jacket, he’s set for life. The Bones biker offers up a timeless design in smooth, premium leather with contemporary design details that keep this classic feeling fresh. Whether you throw it on with wool trousers and a roll neck now, or over a T-shirt and jeans when it gets warmer, the cost-per-wear calculations are looking very good indeed. Mixing and matching blazers and trousers is an easy way to keep your look fresh. But for the time-strapped and style-conscious guy, a single-breasted suit in blue is a shortcut to an on-duty style that works every time. The Duchess two-piece strikes the sartorial middle ground with a modern fit (not too baggy or too slim) while its wool-blend weave ensures it’ll feel just at home in the boardroom as it will dressed up for a wedding, so there’s no chance of it gathering dust at the back of the wardrobe. If you’re after outerwear that can be chucked on at a moment’s notice without risk of ruining your outfit, grey, navy and black are the safest choices. But ‘safe’ doesn’t have to be boring. Take the Belvour wool-blend overcoat, for example. It boasts a mottled black and grey weave for a hit of textural interest that’ll sit nicely alongside any weekend look and will score plenty of admiring glances on the commute, too. Like most things in life, with shoes, you get what you pay for. The Allen Edmonds Leeds 2 Derbies are crafted from cordovan leather (prized for its exceptional durability and ability to stay wrinkle-free), boast a durable Goodyear welt construction and have undergone a 212-step manufacturing process. Fast and flighty fashion, these are not. Their versatile design means they’re ideal for wearing to a spectrum of smart events, but they’ll also appear just as handsome when worn with a pair of chinos or jeans. Most men have got to grips with the camel coat, but why stop there? The ribbed Toby zip-through jumper goes big on design interest, sitting somewhere between a roll neck and a track jacket, plus has the added benefit of being woven from a Merino wool-blend, which means it feels just as good as it looks. Layer yours beneath a camel coat for maximum tonal dressing swag, or use it as a striking accent to an all-black outfit to lift the look. In this killer knit you really can’t go wrong. Sale season is rife with purchases you never knew you needed (because, really, you didn’t). There’ll be no such buyer’s remorse with the Solomon slim-fit jeans, which may not have the star wattage of a crazy new knit but will stealthily prop up outfits all year round. Wear them cuffed with a crisp Oxford shirt and box-fresh sneakers in summer, or match with a dark knit, Chelsea boots and a navy overcoat now. This pair has got all-rounder written all over them. There are a select handful of menswear items that fall outside the whims of the trends and refuse to date: the field jacket is one of them. The Reiss’ Kamakura design takes the essence of the original but adds a few subtle updates (such as a zip detail collar) to breathe new life into an old favourite. It’s the perfect companion for a roll neck, suede boots and jeans for those tricky days in-between Christmas and New Year’s Eve when you’re not sure what to wear. Heritage design is enjoying a mini-revival in menswear at the moment, and front and centre are patterns that you’ll love as much as your granddad did. The Ossain herringbone weave trousers fuse modern tailoring with an old-school edge, resulting in smartly-cut trews that feel fresh and familiar at the same time. The baseball cap may have a reputation for being a bit of a lazy wardrobe choice (at least as far as your hair goes), but Reiss’ Britain baseball cap takes the design’s shape and updates it in smart wool felt to banish any accusations of scruffiness. Made in partnership with historic London milliner Christy’s, which has produced the finest headgear for almost 250 years, it’s got all the credentials to top off just about any casual look. For those decidedly undecided occasions when a cotton button-down is too much, but a T-shirt is not enough, a denim shirt offers the perfect mid-point. For days off-duty, Reiss’ Denny design will layer effortlessly beneath a camel shawl collar cardigan, or even a grey blazer for New Year’s Eve. Easy. The seasons of menswear being overly prescriptive are long behind us. These days it pays to combine smart and casual pieces to get more out of your wardrobe. The Fenton brushed cotton sweatshirt won’t just be a sound choice for laid-back looks; it works just as well under tailoring. They may not be an obvious candidate for the title of ‘wardrobe staple’, but in our book, a pair of premium sweatpants are no less essential. Aside from the obvious fact that they score high for comfort, the Alistar jogging trousers in soft jersey are much more versatile than you might think. Worn with a camel coat, white sneakers and a black hoodie on the weekend, they’ll hit the athleisure trend on the head, but will look a touch more dressed up if you switch out the hoodie for a crisp white shirt, for a contemporary high-low approach. The polo shirt is one of menswear’s perennial classics, though most guys tend to ignore the virtues of its sharp buttoned collar once the sun has set. Team the long-sleeved and textured Mountain polo with slim chinos and penny loafers for a spin on preppy style, or slot it under a suit for an excuse to ditch the tie in the office. 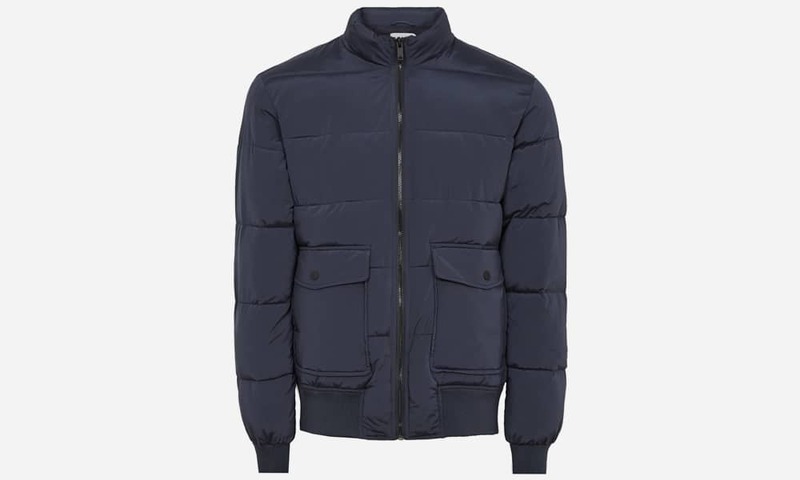 Padded jackets are enjoying a well-deserved resurgence in men’s wardrobes, and it’s safe to say we’re enthusiastic supporters. Not only do they look the business, but they’re also extremely practical when temperatures drop. The Rider quilted jacket takes the essence of a puffer, but slims things down for a much smarter take that doesn’t look out of place with tailored trousers. Usually, sitting on the fence is not looked upon too kindly, but in the case of the Chelsea boot (which is neither fully smart nor casual), it’s most definitely a good thing. The Chalmer boots are crafted from smooth dark brown leather, but details such as their chunky grip soles keep things from looking too formal, which means there’s (nearly) never a bad time to wear them.